The death toll from the collapse of a pedestrian bridge over a road at Miami’s Florida International University on March 15th has risen to at least six, with the university admitting on Saturday that one of the project engineers had waved off concerns over a crack just hours before. Per the Wall Street Journal, the university wrote in a statement that an engineer “concluded that there were no safety concerns and the crack didn’t compromise the structural integrity of the bridge” during a two-hour meeting with FIU and Florida Department of Transportation officials about the $14.2 million, 900-ton-plus structure. The FIU design team’s lead engineer separately contacted FDOT regarding the crack, but only left a voicemail stating that they weren’t concerned about safety issues that was not heard until March 16th. National Transportation Safety Board investigators said it was much too early to determine for sure why the bridge plummeted into traffic, and that the presence of the fissure did not necessarily explain what went wrong. Per the New York Times, officials with the NTSB said construction crews were onsite and tightening tensioning cables that ran inside a diagonal beam on the bridge’s north end at roughly the same time it collapsed. The Journal, however, wrote that Miami-Dade County Mayor Carlos Giménez and other officials said they were told the crews were running a stress test—without closing the road or even scheduling it for night, when traffic might have been lighter. Per Reuters, the structure was supposed to last 100 years, resist a Category 5 hurricane, and even resist grime with “self-cleaning concrete” infused with titanium oxide. It was also towed into place in just hours using a new technique called “Accelerated Bridge Construction.” Though that may sound slightly alarming, Wired reports the method itself has been used in a number of other engineering projects without incident, and is generally regarded as less disruptive to traffic and safer for workers than static construction projects. 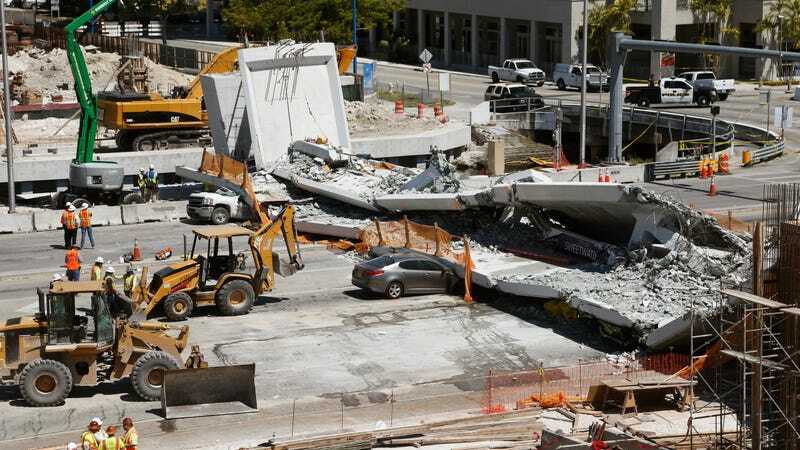 According to the Miami Herald, Bridging Solutions engineer Ralph Verrastro said that most collapses result from construction deficiencies, not design mistakes, and that the bridge was unusually heavy and concrete-laden. University of California Berkeley catastrophic risk expert Robert Bea added that it is possible the process of tightening the cables went wrong, though Verrastro said that in a properly built bridge, that should not have affected its structural integrity. FIU started a center to “advance the frontier” in the field in 2010 after identifying a need for more engineers trained in the method. Since launching in 2011, the center has drawn 4,000 people to its webinars, according to the website. In 2016, it became one of just 20 accelerated building programs nationwide to receive federal funding that amounts to $10 million over five years. According to the Washington Post, officials have recovered at least two of the eight vehicles trapped by the collapsed bridge, but have warned four will be “very difficult to extract.” Though the death count is currently estimated at six, they have warned it may rise as crews sort through the rubble. Correction 3/18/2018: An earlier version of this article cited reports that incorrectly referred to the cables being tightened as “suspension cables.” Those do not appear to have been installed at the time of the collapse, and NTSB investigators were actually referring to tensioning cables.